The picture that developed over the first few weeks we were getting to know Bixie proved far worse than I first expected. Aggression doesn’t trouble me because it’s a problem that at least is at the surface, and I’ve learned that the dog who has the heart to fight, as misdirected as the fight they may pick to fight may be, concurrently has that same capacity to heal. Heart is Heart. So being a predictably aggressive dog has a plus side. However it’s the little quirks in a dog’s temperament that are of the most concern to my way of looking at things because they reveal a deep seated “loading” process which means that the dog is constantly acquiring an emotional charge from the most innocuous, everyday sources. And this emotional charge can only go out the way IT went in. In other words, if the dog is getting stressed or hyper-excited by way of incidental things, this is like a trickle charge hooked up to a battery and then the charge grows and grows until the battery overheats and explodes, which in Bixie’s case is aggression when she is groomed, collared, touched when she doesn’t want to be touched, or when she has food/bone/toy, the list goes on but most especially she saves up her loaded state for when she is being locked in her crate. One super cold morning when I was hooking her to the long line to begin a walk I had to yank the long lead that had frozen into the ground overnight. When Bixie saw my arms moving she hit the deck and cowered like I was about to slam her with a plank. Somewhere in her puppyhood Bixie was “corrected,” hit with someone’s hand. In that moment she saw it coming at her again. This is why the The Natural Dog Training imprint is so important for a young puppy. When you correct a puppy you are creating an emotional charge before she has the emotional capacity to deal with it. For example, you wouldn’t expose a very young child to a horror movie until they’re old enough. So Bixie was corrected in the “usual” ways, housebreaking, manners, no-bite, leave it, etc. and she carries that imprint in every cell of her body and this thereby represents the crack in her temperament, the fault line out of which molten aggression is going to erupt. This also means she is “bleeding out” social energy in all these minor occurrences because it’s constantly eroding away her emotional capacity. Now I know many dogs are raised this way and they don’t all end up like Bixie, but she has a strong temperament and fierce nature that wasn’t allowed an appropriate outlet. Her owners thought being cute and friendly was the same as being social. The shelters are full of dogs with aggression problems because of this. So the emotional charge she picked up from that experience is now manifesting in her adult life. This is an important point: The charge will not usually be “released” until later, sometimes years, so we don’t make the connection between the imprint of upbringing and all the things a dog does later. A dog biting his owners hand after he grows up is not random, this was implanted some time ago. For Bixie, one way that charge comes out is when we put her in the crate and she goes for the hand at the latch. It isn’t that she balks at going into the crate, quite the contrary, she hurtles herself in and then immediately whirls around and attacks the hand at the gate. This is crate rage, akin to a motorists’ road rage. Inside her crate Bixie feels safe to express the rage she’s carrying in latent form in everyday life and which otherwise makes her personality uber-ebullient in some situations and hyper manic in others. The crate is her chance to vent, the opportunity to take all this diffuse pressure she’s constantly absorbing and then expressing it in as coherent (in the sense of having a concrete target) a manner as possible. Thus Bixie can’t wait to get inside her create so that she can explode as this is the only way she can find relief from her constantly charged state. 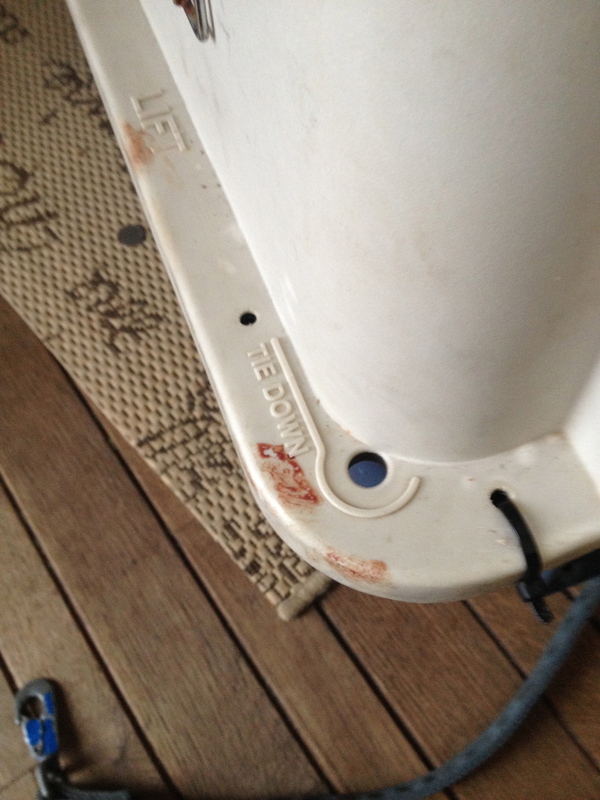 The short list of “loading inputs” is shadows on walls, being approached when in her outdoor kennel or indoor crate, snakes, low flying jets, woodpeckers, chickadees too close to the bird feeder, robins on the lawn, the slightest trace of our cat, the ultrasound frequencies of small prey animals, the water spritzer on the sink, the beam of a flashlight, typing on a computer, an engine starting, metallic objects overhead, sirens on TV, trucks going by the road about 1/2 mile away. In other words, pretty much everything. Today there’s much discussion in training circles about keeping a dog “under threshold” in order for them to learn new ways of dealing with stress, but what then should one do with a dog that is always OVER threshold? This is the dilemma that some many owners of hyper-happy, overloaded and manic prey-instinct-addled dogs are having to contend with. The crate is our most important tool of rehabilitation because it’s the easiest way for a dog to learn that being calm is what makes the world go round, they don’t always have to be running the treadmill of their personality to keep it spinning. Furthermore Bixie can’t be learning anything bad if she’s in her crate and with the crate in the quietest spot possible I can keep the loading inputs minimized. So since the crate is so important my first order of business is to be able to move her in and out of the crate without her usual meltdown. Letting her out of the crate is no problem because she associates this with her chance to shine and be the life of the never ending party always underway in her hyper developed personality. At first I began by being as benign as possible and simply throwing food into the back of the crate and attempting to soften her this way. But no sooner had she snarked up a mouthful of kibble than she was already spinning around and hitting the gate, only now in addition to the normal and vicious cacophony of growls, snarls, and smashing and gnawing of teeth on metal, was a horrid choking and coughing sound as well. And as I would try to get the gate latched, fumbling to align the up and down spokes into their respective slots, she could in fact bite me through the mesh as her teeth could stray outside and get around the spring loaded snap. My fingers tingled on the rods like I was trying to fish out a piece of toast immeshed in the red hot wires of a toaster. So I stopped using food to deflect her attention from the gate because she merely incorporated this into her spin around and attack move, only now even more intense since food guarding was adding even more energy to the mix. Since diving into the crate is linked to attacking at the gate, that’s where I have to get a handle on the problem. 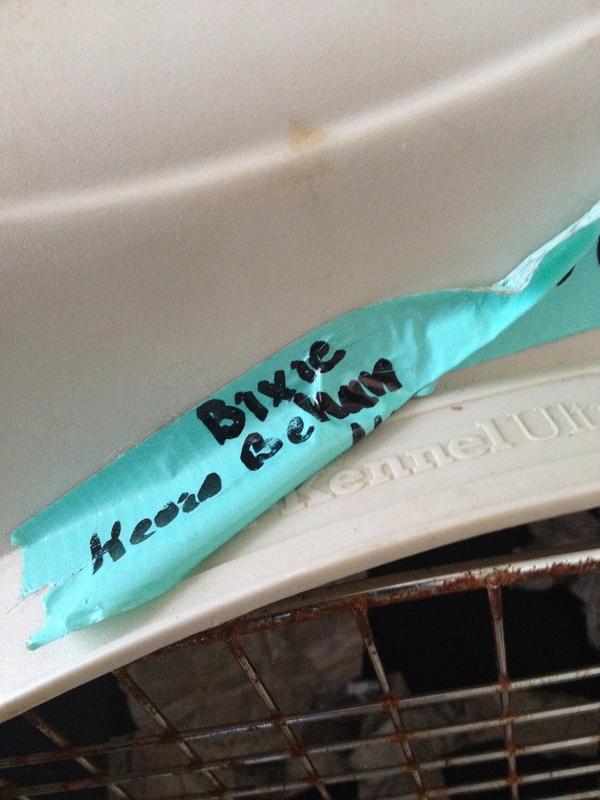 This means collected walking on the high collar as we approach the crate, but as a preliminary to this, I must do some box “challenges” so that Bixie can become attuned to the high collar as a feedback device. By fighting to get on the box, she gets the fight that has been programmed into her, out of her system, after which she softens, and now I can massage her neck. Now she will be able to associate my touch with a relaxed state and she can feel the pleasure of a massage in the moment rather than relive her fear of my hand when in a charged state. After I make this inroad, she’s ready for a high collar, collected walk into the crate. She has to walk slowly instead of pulling with all her might to get in there and now she likewise associates this feeling of softening, of being collected and in alignment and in sync with my movements, with the lessening of pressure from the high collar. This is a feedback experience. If she panics to get in the crate, just like she panics to get on the box, SHE MAKES HERSELF uncomfortable. I have nothing to do with it even though of course I’ve contrived for it to happen by the precise angle by which I’m holding her lead over the box. Then when she relaxes, SHE MAKES HERSELF comfortable. Now she associates me and my hand massage with calmness, rather than as a boogie man from her past. And so after she goes in her crate I can massage her neck at the gate. She is now able to feel pleasure rather than fear. She actually is feeling in control of what is happening around her because of the feedback dynamic of the high collar. This is Step One. Here is Bixie after learning that calmness begets pleasure and which then allows me to use pleasure to raise her threshold. Sorry that this post has been so long in coming, busy times here on the farm. 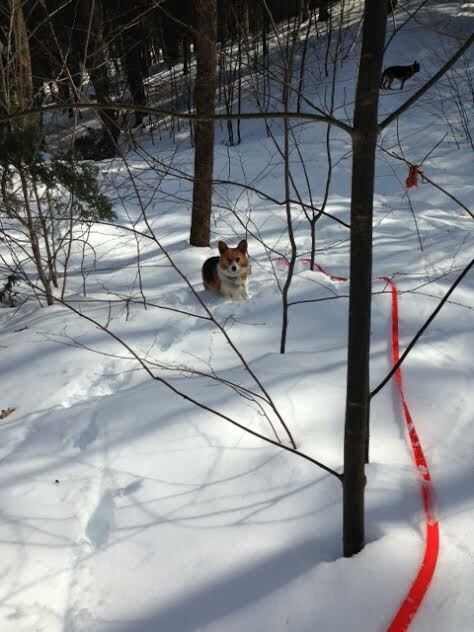 But we have been training and documenting Bixie’s progress so you will get the details! Kevin has a few words to say about the subject of hugs and kisses, we hope this will help you to understand why we don’t believe in them. In the last Bixie blog I stressed that dogs don’t like being hugged and kissed. This prompted a bit of feedback and questioning. Admittedly nothing is more annoying than what might seem like unsolicited advice about what one’s own beloved dog likes or dislikes. Who but an owner should know their dog? This can seem intrusive. But I don’t make the rules. I’m just the dog’s faithful reporter. For the record I’ve certainly experienced a dog insistently clawing at my pant leg trying to clamber up into my arms. And I’ve lain many a time on the ground and been mobbed by a dog or covey of puppies exuberantly trying to get in my face and roll on my head. It’s cute I won’t deny. And it’s nice to be wanted I will concede. But really and truly, it’s cute until it isn’t cute, and am I fooling myself that it is truly an expression of love? Puppies and dogs have an innate drive to get into our face because they want to feel connected to us. This is not ideal as it will become an annoying habit and one day he might chip your tooth, or jump up your grandmother. And then you’ll get mad, and maybe hit him, etc. etc…. Head-to-head contact is stressful for animals because it induces a feeling of pressure. The animal mind perceives that where another being directs their attention is an application of force. If you would like to know what this pressure feels like, take two magnets and hold them together pole to like- pole. You’ll find it’s a lot of work to contain that pressure. No wonder that most dogs after receiving a hug withdraw and then shake it off. One of the biggest reasons for dogs wanting to get into our face is that they have been trained that our attention is their metric of connection.These dogs have to work at getting the owner’s attention, licking, nudging and whining for it. Just being around the owner is not enough.This is because the dog does not feel connected, like a child constantly clinging and whining. If they think your means of connecting is this type of display, they will become obsessed with it, and therefore guarding you from others, people and dogs. Many people think that a dog following them around from room to room is an indication of love, it’s really not. if your child or spouse did this, we would automatically recognize this as insecurity: not connected. If hugs and kisses are the essence of trust, where is that trust when you really need it? I’ve never owned a dog “friendlier” or more “passionate” about bestowing “kisses” than our Bixie girl. She literally throws herself into one’s arms and doesn’t quit until her snout is pressed tight to face. But where is that “love” when I really need it, when I want to pluck a burr from under her flanks, when I want to trim her nails or take a stick out of her mouth because I’m afraid it’s going to splinter, when I want her to be gentle around our cat? Where does all that love go? Friendliness is a nervous response to social pressure, it’s not the same as pure social. It’s an adaptive coping mechanism that has great value, for example it can get one through the awkward social context of being thrown together with complete strangers on a short elevator ride, but it’s not a pure expression of emotional flow. On You Tube there are videos of wolves frenziedly trying to connect with their keeper and I’ve been privy to several wolf-human interactions that began “friendly” only to end with or come close to, a severe bite. When we see wolves licking the lips of an alpha wolf, it’s clear this is not a display of love, rather it’s a nervous, ungrounded desperate attempt to connect. Have a look at one of these videos and you’ll see the same expression in the wolves as in your pet. Here’s a video of wolves reuniting with a woman. Watch as the “loving” turns contentious and you’ll also see the wolves nipping and almost biting her. The tension is displaced onto the other wolves luckily, but the point is licking is really displaced biting. The canine equivalent to a hug and a kiss is soft “mawing,” a wide open gaping jaw with a grip that doesn’t bear down, equivalent to a deep tissue massage, pleasurable and comforting to the recipient. I advise my clients that they can maw their dog all day long, with their hands, massaging the dog’s neck. So I’m not saying don’t give a dog affection, I’m suggesting that dogs like to be touched the same way we do. Whatever we would pay a masseuse to do to us, rest assured dogs love it just as much. We are going on our third week with Bixie now. Her routine has been a simple one: We let her out of the crate first thing in the morning and walk her about 15 minutes feeding her from our hand while we do some of the core exercises, like pushing. Then she goes into her outside kennel until we take her out again for more of the same. We don’t do any of the “normal” training, like sit, heel, or down during these walks, we just let her drag a 50 foot lead and she goes pretty much where she wants, we follow. One important thing we did right away was move her crate from our large great room to an out-of-the-way spot in our attached cottage. The reason for this was she started getting aggressive whenever our German Shepherd Hessian walked any where near the crate. Even when he came in from outside 15 feet away, she would lunge and bark aggressively. There are those who might say she was doing this because she didn’t want to be in there, she was jealous, etc. but that isn’t really why. Bixie feels safe to let out the “charge” she has been picking up all day. Basically Bixie gets charged by everyday normal things that don’t bother most dogs. Things like birds high up in the trees, airplanes at 30,000 feet (yes!) crinkly noises, a moth fluttering by…and this builds up in her but must be released sooner or later. 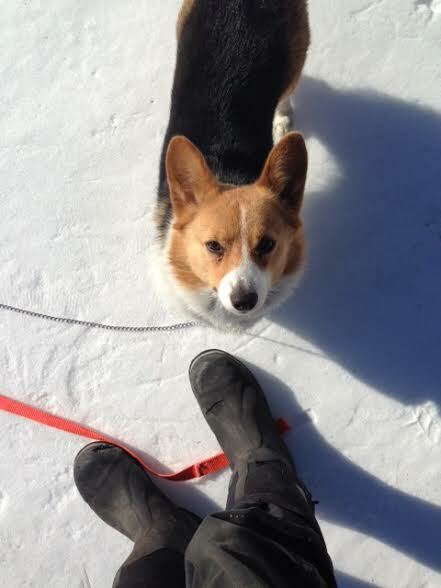 While some dogs like Corgi’s can be sensitive, this behavior was created, it is not inherent. And it was created when as a pup she was treated like a love cushion, getting picked up, hugged and kissed. Then when she “misbehaved” in some way, she was hit, kicked or “disciplined”. One minute it’s all love, love, love, and then the next minute it’s whack! Out of nowhere comes a kick or smack. Her fragile emotional development at a young age was not understood. So we moved her away from this situation for two reasons, one so she can be totally free and calm in her crate. She needs to have this space. It is very critical for a dog, no matter how they are raised or how old they are. Just as it is for humans, we need a space where we can feel safe and free to be ourselves. This space can then become part of us and we take it with us wherever we go. It’s the same for dogs. 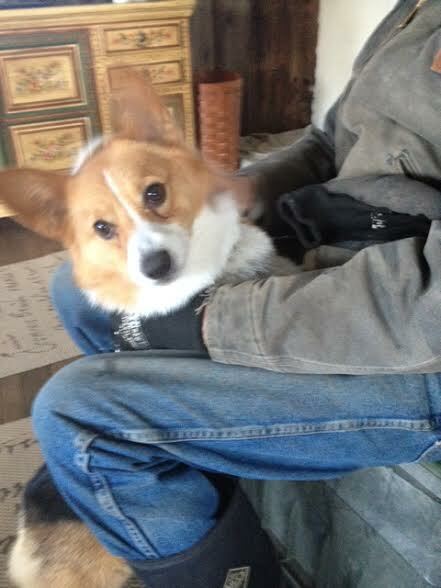 We are re-training Bixie to feel safe in her surroundings rather than be afraid every minute. The other reason is that whatever progress we make with her on our “core walks” will be lost if she is constantly having these crate episodes with Hessian. So if you have a dog with issues like this, move them to a place where there is not a lot of traffic coming and going. If they start barking because they can see you, or the cat, or another pet, you won’t have to deal with it but can ignore it. It’s better for them and for you too. At first glance, our new dog Bixie is outgoing, has good nerves, is self-confident, excited by new things rather than frightened, great with dogs, and loves, loves, loves to play. But there is another side to this coin because this endearing suite of traits didn’t land her in the doggie clink. Here’s the other side, one that counterbalances what is immediately lovable about Bixie. The main problem is that she will bite (hard) if you approach her food bowl, scraps, bones, when putting her in a crate, vetting, any kind of grooming, trying to pick her up, trying to put on a collar. And she’s lightening quick about it. There is very little warning, she goes from slightly tense to an all out explosion in a nanosecond. We don’t know how Bixie was raised and trained, but we have a pretty good idea. Mostly all the dogs who come here have varying degrees of the same problem. And I I know from experience that these dogs were not raised the Natural Dog Training way. People give their pup too much freedom right from the start and then they are always managing, tending, scolding, and sometimes hitting, or disciplining as some like to call it. This is the number one mistake dog owners make when raising a puppy or adopting a dog. Right at the outset they open their house and hearth as wide as they can, and along with the dog that happily bounds inside to join them come age old primal instincts. The results are that the dog learns he cannot trust their human. Going over to the juicy garbage, or the cookie on the coffee table becomes a lesson in terror for the pup. The well meaning owner thinks he is teaching the pup some important rules, and he is: whenever the pup gets excited about something, avoid human. And now the bond has been damaged, and it becomes evident as the pup no longer comes when called, runs away, or in the 1 out of 10 cases, turn into what Bixie has become. So we are now going to reprogram the hard drive. And the first thing we do is to give the dog a safe place- the crate. She’s safe in there. She’s not learning anything bad in there. She’s waiting to connect with me and I control how, so she will always have a good experience. One cannot overdo the crate. Of course if you have a pup he’ll need to go out more often than an adult dog, and If you’re rescuing a dog he is already the luckiest dog in the world. Your dog is alive because of you. Guilt and the pernicious statement that follows “Then why even have a dog?” is the number one reason the owners of rescue dogs fail, and puppies as well. But guilt will always lead to a bad handling or training decision. So try not to feel guilty when you put your dog in his crate. We need to shape the pup or dog to be able to live in our world, a world that is very stressful for our canine friends. There are so many things our dogs can’t do, things like don’t pull on the leash, don’t jump on the counters, don’t chase the cat….don’t…don’t…don’t…Yet most people and professional dog trainers for that matter don’t tell the dog what to do with their energy. And this is one very important part of the NDT method, teaching dogs what to with their energy and instincts. Mostly, especially when they’re pups, we let the dog learn in a way that doesn’t damage him. So for the beginning of Bixie’s rehab is a long day of crate duty interspersed with a few brief walks because this winter it’s bitter cold and our Dixie girl isn’t ready for a winter in Vermont. In five minutes her paws are in the air and she wants to come in. In addition to these walks I conduct some short training sessions on the core exercises. She feeds from my hand doing these exercises, I don’t give her any food in a bowl. Outside she’s always on a long lead so I don’t have to coerce her into doing what I need her to do. I just walk along and manage the lead. I don’t say a word. I just move. I give her lots of rub-a-dubs and she melts to the touch. I want to be crystal clear on an important point. The therapeutic value of exercise is vastly overrated. I’m not against exercise, exercise is good, especially nice quiet walks in the woods. But dogs don’t need exercise as the current marketplace demands. It’s not up there on the first tier of needs along with food, water, air, and the ultimate primacy, RAPPORT, aka connection. In fact if one is exercising their dog and running into charged situations, there is further damage being done and the dog isn’t being helped in connecting with the most important stabilizing influence in its life, its owner. The dog is being frustrated, irritated, overly stimulated, possibly even frightened. Therefore if you are in the first phases of rehabilitating a problem dog and don’t have time to exercise your dog outdoors, or if the weather is too severe, then all you have to do is remind yourself that you don’t have time and the weather is too severe. That’s it. Don’t try to compensate by giving the dog freedom indoors or worse, playing indoors thinking the pooch needs exercise and mental stimulation. So we’ve had Bixie for a week now and are basically in the getting acquainted phase, keeping her out of trouble and building rapport. The video below, sent to us before we got her, shows the mountain we’re getting ready to climb. Sorry for the blurry beginning. So we want to fill you in on Bixie. 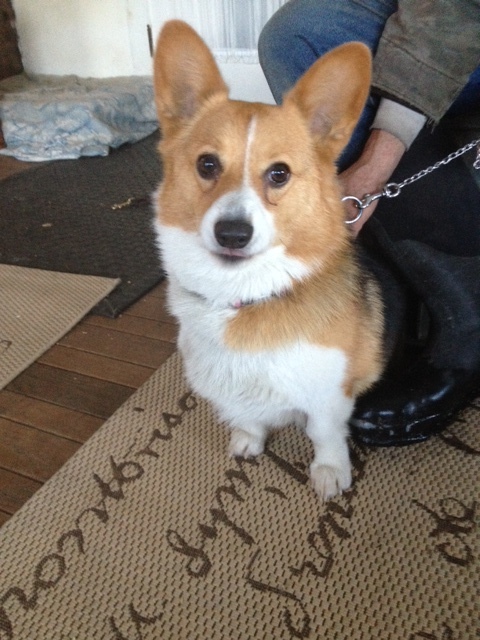 She’s a 2 1/2 year old Pembroke Welsh Corgi. We don’t know anything about who raised her from a puppy, but we do know that she was given up for her aggression problem. Little by little we should be able to piece her history together from what we observe in her now. She did go through some kind of behavioral program and her papers from the vet say they were considering putting her on meds. Luckily we got her before that happened, as once a dog gets on this insane practice rehabilitating them is much more difficult. Aggressive dogs aren’t suffering from a chemical imbalance, they’re suffering from an emotional blockage, this is why they have an unbalanced neurochemistry. Psychotropic drugs numb them to the very core we need to get to in order to release the emotional block. She arrived from Alabama a week ago, driven up with other adoptees. Here’s a picture of her crate with the evidence of why she was given up twice. So Kevin took her out of the crate and began to supple her neck, this will be a big part of her rehabilitation. Next we walked her around a little bit before saying goodbye to Jeanette and bringing Bixie inside to her new home. Once inside we didn’t just let her loose. She is on the leash at all times. If we can’t sit with her then she goes into the crate, just like a baby that you can’t keep your eye on and so gets placed into the playpen. The crate is for her protection (and ours), it’s not a punishment. This is the routine for the first few days and then we’ll start slowly working with her. We weren’t looking for a new dog. Our German Shepherd Hexxie that we raised for almost 13 years died suddenly. We didn’t want to replace her with a new dog, but a few days after she died Kevin got a call from a rescue organization in Alabama. Could he rehabilitate a black Lab who was adopted and now lived in nearby Massachusetts? 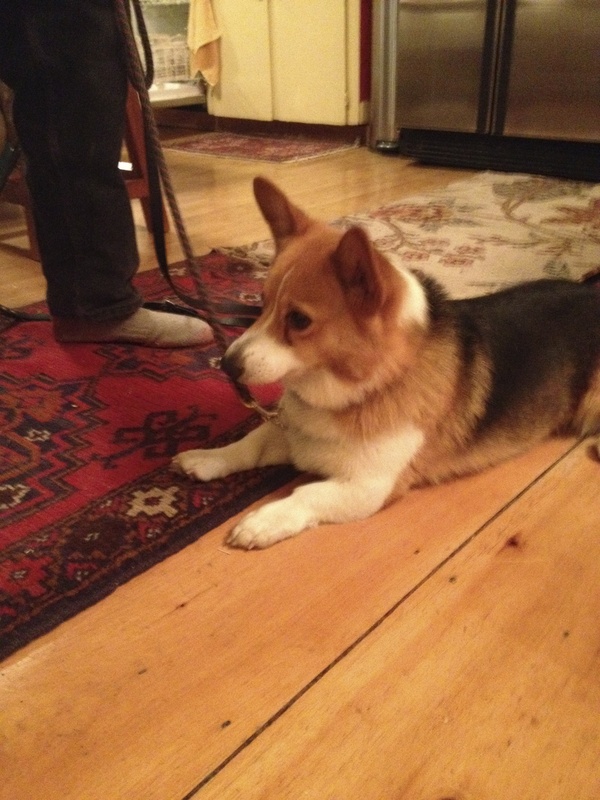 The conversation turned to the Corgi that Jeanette was now also trying to find a home for. She filled us in a little about her, basically that she was aggressive in certain situations. 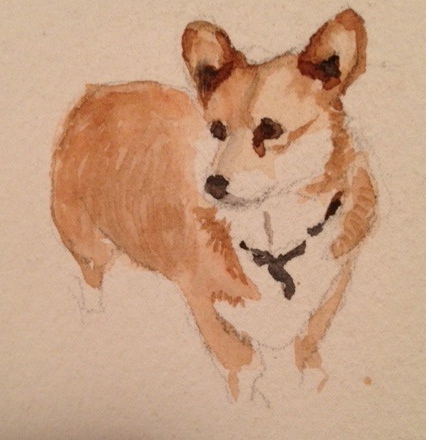 Corgis have a dear spot in our hearts. We had raised one years ago and always said we would have another someday. 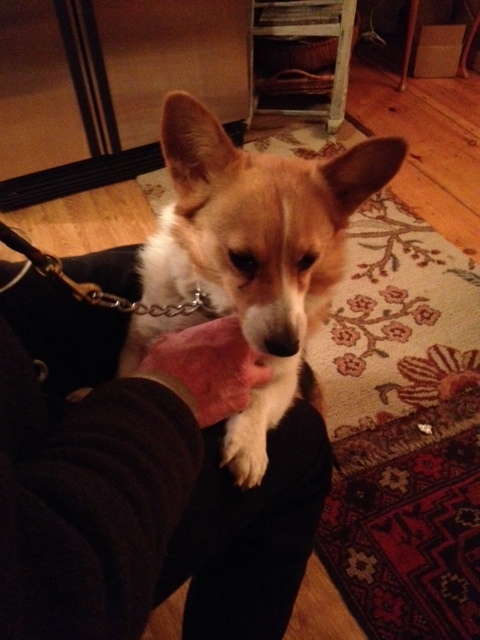 So when we heard about this Corgi we thought “Hmmm….” But what really clinched it was when she told us her name: Bixie. 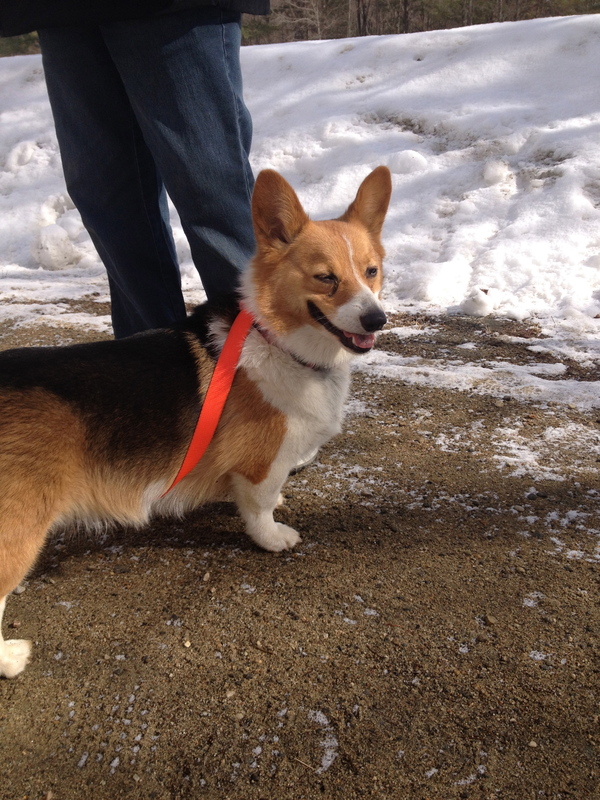 Our beloved Shepherd was named Hexxie, and our Corgi was Barley….put them together and you have Bixie….of course we would take her. 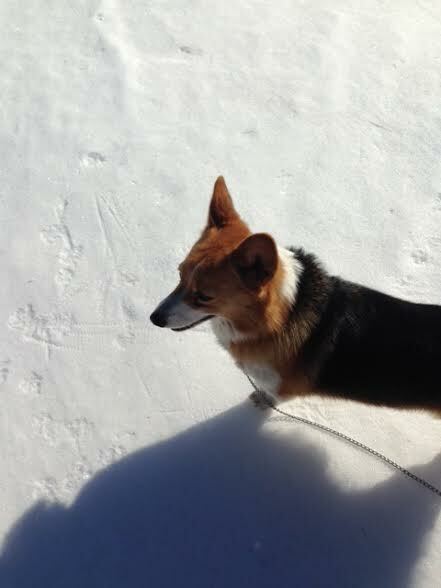 We had never adopted a rescue dog before, all our dogs were raised from pups and trained the NDT way. They were all such a joy to live with, right from the start, even when our kids were babies. Never would they growl or bite or run away. They wouldn’t steal food off a table or chew up the furniture. Kevin once accidentally stepped on our shepherd Illo in the middle of the night and he just looked up and went back to sleep. Unfortunately most dogs are not raised this way, and they end up with behavioral problems, especially aggression. And this is what Bixie’s problem was. But this all flew out the window when we heard her name. And all the synchronicity around her told us that maybe we were meant to learn something. Dogs do always have a lesson to teach us don’t they? So this blog will be the story of Bixie, her beginning with us, her issues, Kevin’s amazing way of healing her and her life as it unfolds in Vermont. Looks pretty cute and harmless doesn’t she?